These 2 1980's consoles were set up on the same stand and used as a 56 channel console, they were installed in Prism Studios in Stoke on Trent in the UK, owned and run by Shaun Lowe. 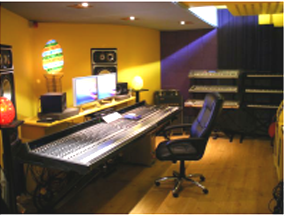 Using the 2 consoles as one 56 channel console Record producer Shaun recently won a Sony music award for his work with American band 'The Drifters' He produced their top 10 album "Up On The Roof" the album was recorded and mixed at Shaun's studio using the MRX consoles. The MRX's are 32 channel and 24 channel consoles both with 8 sub groups and stereo master bus, each channel has a Mic input on XLR, a line input on TRS Jack plus Insert and direct output also on TRS.